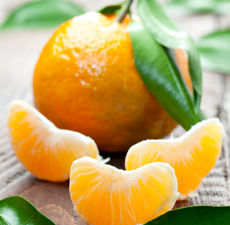 Tangerine Essential Oil has the typical citrus scent – fresh, radiant, and tangy sweet. With only subtle differences, it smells a lot like the Mandarin, with some even considering them identical. In comparison to our Orange, Tangerine can be seen as lighter with more candy-like tones. The Tangerine tree was originally native to China, but is now grown predominantly in the United States and Sicily in Italy. The tree is also very similar to the Mandarin. Tangerine Oil, like most of the citrus family, can be depended upon for its refreshing and rejuvenating characteristics. Its aroma clears the mind and can help to eliminate emotional confusion. Aromatherapists also consider it to be very comforting, soothing and warming. Users may also see Tangerine Essential Oil used in perfumes, soaps, and as an antispasmodic, carminative, digestive, diuretic, sedative, stimulant (digestive and lymphatic), and tonic agent. Tangerines were originally brought to Europe and then the United States via China. Tangerine Oil is similar to other oils in the citrus family in that it can be phototoxic. Avoid use during pregnancy.